When grading assignments in eClass, there are a number of mechanisms for releasing the grades to students. By default, as soon as any grades or feedback are entered by instructors or TAs, these are made available to students. Note: this occurs regardless of the checkbox to 'Notify students' which only controls the sending of messages. 1. Hide the entire assignment during grading - this is accomplished by clicking Edit > Hide to the right of the assignment on the course main page. Using this method will prevent students from seeing the assignment entirely so it should not be used if late submissions are required. 2. 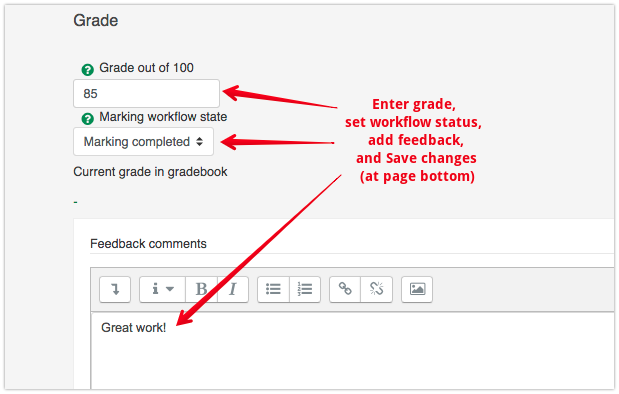 Hiding the assignment from the gradebook - this is accomplished by entering the gradebook Grader report view and clicking Turn editing on near the top right, then clicking the eyeball icon in the column of the assignment in question. 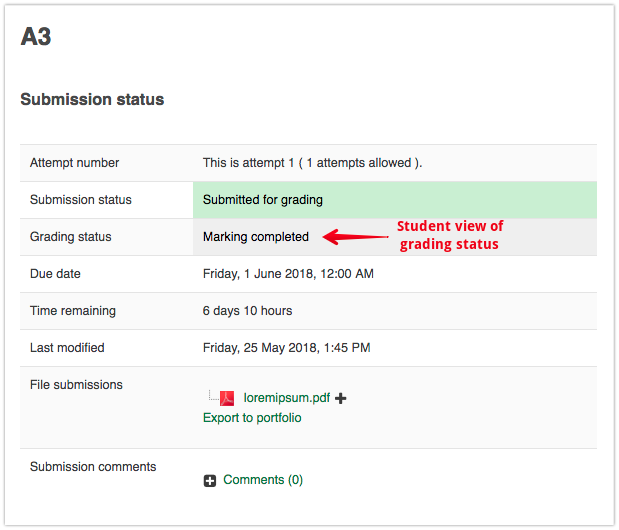 Using this method will allow still allow students to submit late but hides any grading information; the entire column is removed from the student's view of the gradebook. 3. Enabling the Marking Workflow in the assignment settings offers the most flexibility for graders. It allows you and other graders in a course to set a status on assignments as grading work is completed. This can be useful when multiple people are working in the same course and assessment needs to be standardized, reviewed, and/or there is a need to coordinate the release of grades to students. 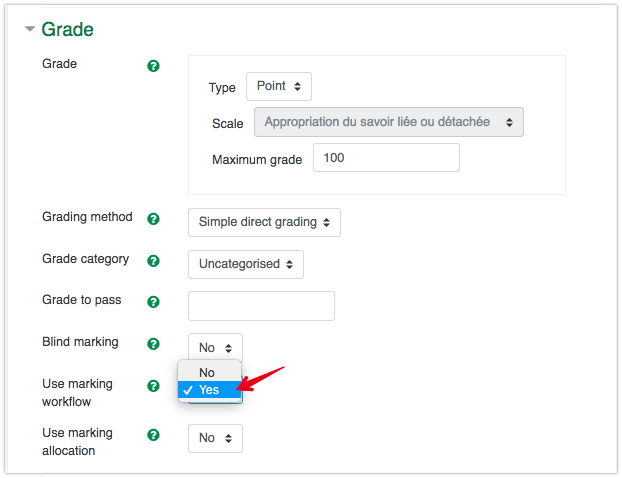 The workflow is added under the 'Grade' area in assignment settings by setting Enable marking workflow to Yes. Once enabled, the available grading statuses are 'Not marked', 'In marking', 'Marking completed', 'In review', 'Ready for release', and 'Released'. 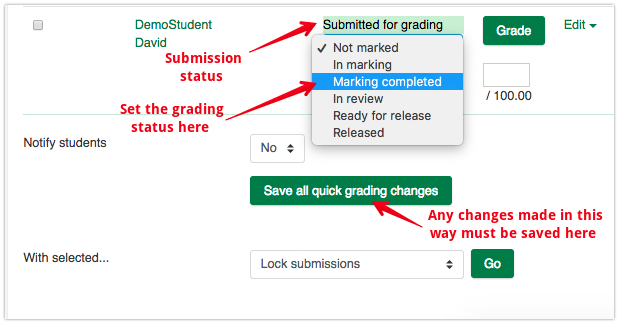 When the workflow is enabled, grades and feedback are hidden from students until the grading status on their assignment is set to 'Released'. All the other statuses are only for the information of graders. These statuses do appear on each student's 'Assignment submission' page (where it is visible as a separate status from the regular assignment submission status). Select all or some of the rows in the table. Scroll to the bottom and change the 'With selected...' dropdown to Set marking workflow state then click Go and Yes when asked to verify that you want to Set marking workflow state for all selected assignments?. 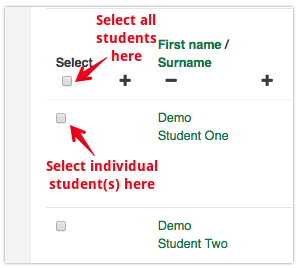 The page will now list the students selected (or the first few along with the line 'X more...') - select the desired 'Marking workflow state' from the dropdown and click Save changes. You can also optionally choose to send a mass notification to students at this time that their assignments are graded by toggling 'Notify students' to Yes before saving changes.